Vermont's F-35 Foes Have Found a Sympathetic Poster Child in "Gramma"
Activists opposed to basing F-35 fighter jets at Burlington International Airport have found a potentially effective spokesperson for their cause. She’s Carmine Sargent, a 69-year-old grandmother who has been living within earshot of the airport since 1972. Sargent — or “Gramma,” as she’s billed by the F-35’s adversaries — made her debut at a press conference and protest staged last month in front of Sen. Patrick Leahy’s Main Street office in Burlington. After speaking at the event, Sargent hand-delivered a box of fudge to Leahy’s fourth-floor suite. She told staffers the gift symbolized the “fudged” process, as a recent Boston Globe article described it, that led the Air Force to pick BTV as one of two preferred basing sites for up to two dozen F-35s. The Globe alleged the Air Force chose Burlington to please Leahy, one of the Senate’s most powerful members. Sargent was recruited to the anti-F-35 movement because PR-savvy organizers decided it needed “a personal component,” says Chris Hurd, a leader of the opposition. He says Sargent has the reassuring, sympathetic qualities that can broaden resistance to the plane’s bed-down at BTV. The T-shirt Hurd wore at the Leahypalooza event is more direct: “Don’t Let ‘Em Screw with Gramma,” it warns. Sargent, a literacy teacher at the Vermont Adult Learning center in Colchester, comes across as well-spoken and warmhearted yet salty and pugnacious. But Sargent had never been in any public protest against the F-35. “I could see the first time I spoke with Carmine that she was afraid to get involved,” Hurd recalls. Afraid of what? Perhaps fearful to take on the united front of political leaders and business interests who favor bringing the fighter planes to Vermont, Hurd replies. Like other airport neighbors worried about the impact of the F-35, Sargent also feared “being demonized as anti-military and anti-development,” Hurd adds. During a recent interview on the backyard patio of her Elizabeth Street home, Sargent says she was indeed reluctant. But she adds that Hurd, who “could sell anyone anything,” cajoled her into signing up. It was the Federal Aviation Administration’s house demolition program that helped tip her into activism, Sargent relates. The feds have purchased and destroyed more than 50 homes in the high-noise zone over the past few years and another 150 moderately priced homes are eligible for the buyout and teardown. “We would all of a sudden see a house being razed, and nobody would talk to us about what was happening,” Sargent recalls. She coined the term “Little Detroit” for South Burlington’s dead zone of bulldozed and vacated homes. Sargent’s own ranch house lies just outside the high-noise zone’s borders. But if the F-35 does bed down about a quarter of a mile away, her home — and those of most of her neighbors — would be exposed to decibel levels that federal officials deem harmful to human health. But Sargent says she would never consider moving away. A single mother, she has invested tens of thousands of dollars to make the home accessible for her 42-year-old daughter, Kara, who has spina bifida, a congenital disorder that requires use of a wheelchair. The house is outfitted with ramps and lowered countertops. Kara works as a teacher’s aide. Sargent’s other daughter, 38-year-old Abby Paige, is a writer living in Ottawa and the mother of Sargent’s 17-month-old grandson. Vermont audiences know Paige for her popular one-woman show, “When We Were French,” about her Quebecois heritage. Both her daughters have artistic talents and interests, Sargent says, gesturing toward a collection of sculptures in the backyard. A hallway inside the home lined with drawings serves as a runway for Wiley, the family’s yapping Yorkshire terrier. Gramma’s next featured appearance is scheduled for May 30 at Burlington’s Unitarian Universalist Church, where she’ll be speaking at a “citizens’ hearing” on the F-35 organized by the plane’s foes. 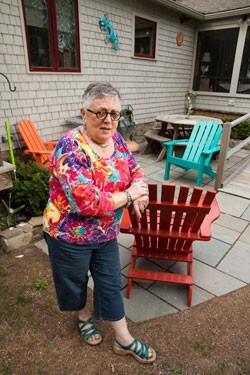 Although recently credentialed as a “Gramma,” the diminutive native Vermonter doesn’t seem at all elderly. And after 23 years teaching literacy — and special education in South Burlington before that — Sargent says she has no plans to retire. As she’s speaking, a plane roars as it takes off from BTV — the first of three interruptions during the hourlong interview. The airport garage acts as a partial sound barrier, but the noise from commercial and military planes remains a constant presence on Elizabeth Street, as it has been for the 41 years Sargent has lived there. Her political engagement over those decades had been limited to voting — mainly for Democrats and independent Sen. Bernie Sanders. But she’s grown disillusioned with many of them — especially Sanders — for backing the F-35 basing. “I wouldn’t ever say I don’t like Bernie, but I’m really shocked at his stance on this,” Sargent declares. Sargent backed two anti-F-35 candidates for South Burlington City Council who were defeated this past March. Of the newly pro-F-35 council, Sargent says, “I’ve never felt like it was government for the people — more for the developers.” And she’s grown to “detest” Burlington Mayor Miro Weinberger for supporting the planes and for appointing South Burlington’s council chairwoman, F-35 backer Pam Mackenzie, to Burlington’s Airport Strategic Planning Committee. “What about consulting somebody who actually lives around here?” Sargent asks. As her public profile rises, Sargent may find herself a target of criticism from the plane’s proponents. “I think it’s wrong to use someone concerned about current airport noise as a figurehead opponent of the F-35,” comments Nicole Citro, founder of the Green Ribbons for the F-35 campaign in support of basing the planes at BTV. Only 6 percent of the noise from aircraft operations at the airport comes from military jets, Citro says. “It’s sad to see this type of attention being given to somebody who’s not even living in the high-noise zone. But given all the antics, I’m not surprised they’ve done this,” she says of the anti-F-35 group.